You are at:Home»Club»Club Men»Club Men: Super Saturday Preview. Lurgan celebrate winning the Gordon West Cup last season. Who will win this year? It’s the first of a few big days out at Ravenhill as the Ulster Club game reaches its business end. The McCambley Cup final last season featured Ballymena IV and Enniskillen III with Ballymena coming out on top. In their progress to this season’s final Ballymoney IV disposed of Enniskillen III in the semifinal after getting a walk over against Ards III in the quarterfinals. Dromore III knocked out the holders, Ballymena IV, away from home, in the quarter finals before defeating Raney OB III in the semi finals. Both teams sit at the top of their respective regional leagues but, due to their participation in the Regional Premiership, Ballymoney would be marginal favourites. However, Dromore beat the mighty Larne III’s in their route to the final and Larne III’s are the only side to beat Ballymoney in their Regional North League. 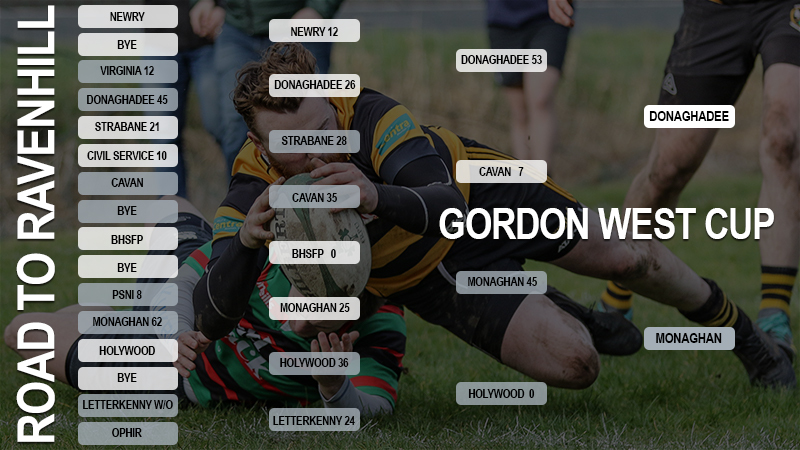 The two pacesetters in the Ulster Rugby Championship Division 3 go head to head in the Gordon West with Donaghadee back for the second successive season following a loss to Lurgan last year. The teams road to Ravenhill is shown below and it’s pleasing to see that the two finalists have played in every round. Donaghadee have beaten Virginia, Newry and Cavan during their journey and Monaghan have dispensed with PSNI, BHSFP and Holywood along the way. While Monaghan recorded a very impressive win against Holywood in the semifinal, they go into the final as heavy underdogs having shipped 107 points, including 17 tries, in two substantial league defeats to their opponents already this season. However, both those games were before Christmas and both sides are undefeated in their last five games. The two teams like to rack up big scores but Monaghan have shipped three times as many points as Dee over the last five league fixtures. The border club will need to have their defence on point if they are to have a chance of silverware. Some say last season’s final, where Ballyclare IV lost by a point to Dungannon III, was the greatest game of the season! There is every sign that this game will be equally enjoyable as the two top sides in Provincial League 5 go head to head. Ballyclare will be hoping to go one better this season but it should be a close one with the sides sharing the honours in their two league meetings. Both matches were close, with only five points separating the teams over the two games, Academy edging the meetings by 27 points to Ballyclare’s 22. With both the club’s senior sides losing out on their respective league titles on their last round of games, I suspect both teams will be well up for this one. Previous ArticleClub Women. All Ireland League – Who Did What?